I have been a fan of music for over forty years, a consumer of music for 30, and an active performer for over twenty and I have reached an age where there is not much room for something new. My music purchases have slowed, and I catch myself returning to the records I bought twenty years ago over and over. They are few and far between… those disks that just grab you, the ones that make you hit play again and again immediately upon the fading of the last note. “Grace Potter & the Nocturnals,” the third and self titled disk by the band from Vermont, fits into this category and strikes the notion that rock is dying from my vocabulary. It will also fall into my long term listening pile. A veteran of the music scene at the ripe young age of 27, Grace Potter has dropped the gauntlet, or just downright stepped on and over, the over-produced tripe that fills today’s airwaves, with this collection of immediately satisfying well- written organic rock. By organic, I mean music played by the musicians on the record cover, not studio musicians or, I shudder to speak it aloud- samples. Stand- out tracks are tough to single out, as this record hits me as a cohesive collection, meant to be played in it’s entirety… If pushed, highlights could be, “Medicine,” with it’s immediate sense of urgency and twisting guitars or first single, “Tiny Light,” which begins as a soulful plea and evolves into a tour de force for all players. Before this review glows too far, I do have one complaint- the inclusion of a re-recorded version of the opening track- “Paris(Ooh La la)” which was released previously as a bonus track to the band’s last cd. 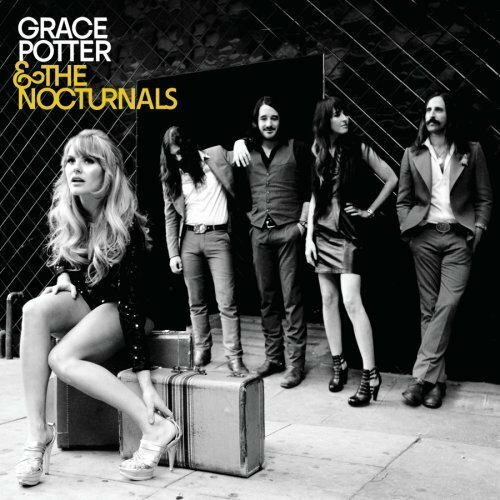 With the addition of bassist, Catherine Popper, a North Carolina native, and second guitarist, Benny Yurco, “Grace Potter & the Nocturnals” delivers on all the promise shown on earlier releases. Buy it, but be ready to hit play- again and again.